I always wondered why my strats and teles seem to stay way better in tune than Les Paul type guitars. I could play either strat or tele throughout a 4 session gig with only checking the tuning and maybe a couple small retunes whereas I can take a Les Paul at home at it will go out of tune almost instantly and constantly. The G string is the worst offender - hit it hard and it'll be sharp. Bend it and it returns. Hit it again - sharp again. Retune it, bend it - flat. I filed the nut groove and that helps for maybe a few weeks, then the problem returns. No way that I would ever take it to a gig that way. Is it the angle where the strings go over the nut? Is it the tune-o-matic bridge (does it matter whether the posts are screwed directly into the body or sit in inserts)? What can be done to cure this? Or is this endemic to Les Pauls? I remember seeing a Whitesnake show where Doug Aldrich used at least 4 different Les Pauls and changed instruments after each song - is that tuning problem related? you have a problem with a g string ? You need to use 3'n'1 oil on the nut, and cut the nut slots to the proper gauge of string your using. And just to clarify: I was not referring to Gibson with my post - none of my guitars are Gibsons. Something is binding somewhere. How steep an angle are your strings coming up from the tailpiece to the bridge saddles at? Do you topwrap your strings? What is the nut made out of, and did you use the correct sized files when you filed the nut slots? Are the nut slots shaped correctly? How are you winding your strings around the tuning posts? Are you bridge saddles and bridge stable? How steep an angle are your strings coming up from the tailpiece to the bridge saddles at? I checked that the strings do not touch the edge of the bridge. The tailpiece is quite high. Do you topwrap your strings? No I don't. Would that help? What is the nut made out of, and did you use the correct sized files when you filed the nut slots? The nut is made of bone. I have a nut file set which I use for this purpose so I would answer yes. Are the nut slots shaped correctly? When I file the grooves I make sure that the highest point is at the edge to the fretboard and that there is only a gentle slope to the headstock. The groove bottom is round. The groove's depth is not more than half the string diameter. How are you winding your strings around the tuning posts? Locking tuners: I pull the string through with some slack, lock the tuner, tune to pitch, cut the excess string off. In most cases there is a half to a full winding on the post. Other tuners: I cut the string at about an inch past the tuner hole, put the string through the hole, put one winding above the string and all the others below. Normally there are three to four windings on the post. One local luthier does a knot because he thinks the strings stay in tune better that way. I disagree, and it's a pain in the ... to change strings afterwards. But honestly I don't think it's the way how the strings are wound - otherwise I would have the same problems with strats and teles and I don't. Are you bridge saddles and bridge stable? There may be a problem. The tune-o-matics I have are the old style which are screwed directly into the wood without the bushings. 90% of general tuning issues people bring me and blame on nuts, bad trems, cheap tuners, etc, are due to loose parts. Mostly the nut around the peg and the screws that hold the pegs tight. 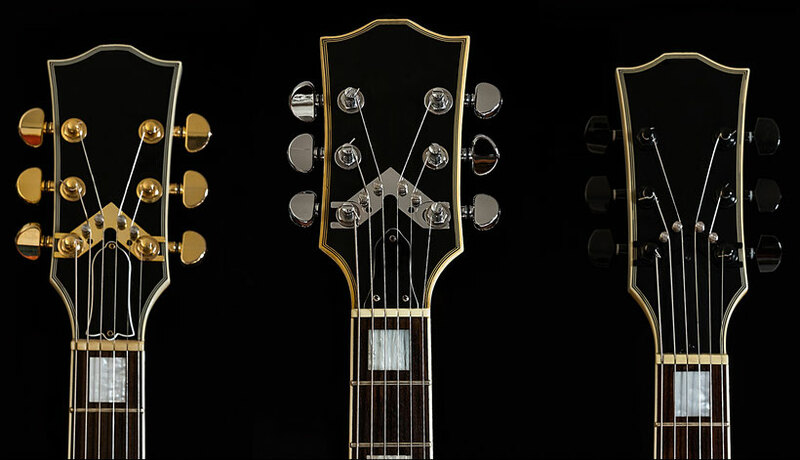 With a LP type, you have a huge amount of down pressure due to the angle headstock creating friction, and the string going over the nut then shooting off at an angle to the tuner. You mentioned you have a bone nut. Bone is fine for acoustics where you aren't bending strings all the time, or (maybe) straighter string pull guitars like a Tele or a strat if you can tolerate either using lube (yuck) or some minor tuning issues. On electrics, I don't recommend, nor do I personally use, anything but graphtech, and only use bone after a discussion of the above with a customer and at their request even knowing the potential issues. A properly cut graphtech nut will never need lube, and will stay in tune as well as any other guitar when used on a LP. Another issue you have with a tune-o and stoptail type guitar is sharp down angle after the bridge over a sharp metal saddle. Most people see the screws on the tailpiece and assume "hey it's a screw, lets screw it all the way in!" but that is not necessary and can lead to tuning issues, collapsing bridges, etc. It only needs to be down far enough to create enough down pressure over the saddle. Also, the string going over that sharp, pointed metal saddle and being bent so it slides a bit can be an issue. Again, graphtech saddles are the cure for that, and I find they sound very nice on a tune-o type bridge. If your bridge is loose on the posts and can slide a bit, that can also create tuning issues (as well as intonation issues as it moves around over time). Tonepros bridges are the cure for that. I don't think they do anything for "sustain & tone" as they claim, but they DO keep parts from sliding around and from falling off during string changes, and from having to re-do your action height after string changes. A fairly cheap investment, or get a tap & drill and some set screws and make your own. A final issue is string stretching. Few people seem to stretch their strings out enough. I grab them at the 12th, yank them up and down, back and forth, then re-tune, and when they no longer go out of tune, they are stretched. Even my LPs and similar guitars with trems (bigsbys, deusenberg les trems) stay in tune great, but it takes some extra steps to get there due to the non-straight string pull past the nut and the down pressure from the angled stock. Many thanks for these detailed comments. I check the tuner nuts with each string change. OK, understood. I guess the Tusq XL would work. Does it make sense to go with pre-slotted nuts? That would be the string saver saddles, right? So that pinpoints the problems to nut, saddles and bridge movements. I will see which guitar will become the guinea pig to try the suggestions. After owning a dozen Les Pauls and 4-5 other singlecuts, as well as teles and strats and several things i was going to post were mentioned: make sure nut is lubed and properly cut, make sure guitar is intonated, and wrap strings properly and stretch them and retune a few times. Locking tuners are not required but they help. Sounds like a case of nut binding. I had that problem once with an epi LP. Took it to my tech and he just cleaned up the slots. Meanwhile I replaced the tune-o-matic bridges on two guitars with Graphtec Resomax bridges. That helped a lot and to a point where it's working OK.
Lubing the nut helps, as does having a good self lubricating nut that is well cut. I have two Les Pauls, neither of which has a big issue with this, but they also do not have quite the tuning stability of my strat or tele in their stock state. I can, however, vouch for something I am using on my Les Paul Standard - it's called a string butler. Essentially, you attach it to your bottom two tuning pegs. It makes the strings break straight out of the nut and not bend towards the tuners until further up the head stock. It looks like this. They cost more than they probably should at around $50, but it works well. I’m glad I saw this post today! I have a LP that I’ve been contemplating changing the nut on. It currently has a bone nut but I want to put a graphtech on there. I was thinking of the XL series. Is there a particular nut you would recommend of Dino just get the one closest to the dimensions only the current nut?